Patented solid-state destroyer with 90 spikes to puncture, perforate, and waffle media, demolishing the individual memory chips so data cannot be retrieved. We offer equipment rental and data destruction services for small businesses, economical degaussers and destroyers for small- to mid-size companies, and NSA/CSS EPL-listed equipment that meets the data security requirements of multinational enterprises, government contractors and the United States government. 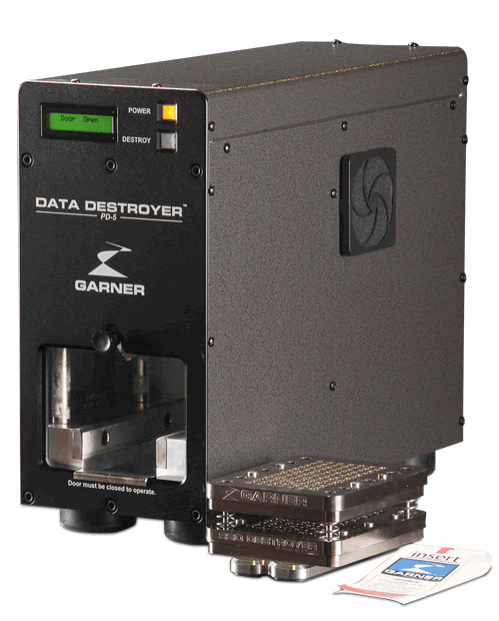 Highly sensitive classified and top-secret data demands the ultimate erasing power of our TS-1 Hard Drive & Tape Degausser. Listed on the NSA/CSS Evaluated Products List (EPL) for erasure of top-secret data, the TS-1 generates an evenly distributed 20,000 gauss (2 Tesla) magnetic field. The TS-1 delivers maximum erasure to every area of the drive or tape, no matter how drives or tapes are oriented in the media drawer. The TS-1 also comes with a USB port so that you can take advantage of our optional SCAN-1 scanner and software package to create an audit-worthy media destruction report as you degauss. 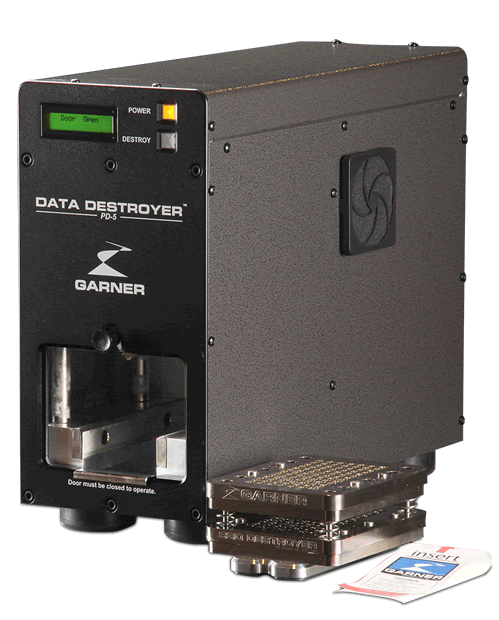 Listed on the NSA/CSS Evaluated Products List (EPL) for Hard Drive Degaussers. Meets the toughest standards for erasing hard drive and tape media containing U.S. government classified top-secret data, as well as all other government and industry mandated standards for data elimination prior to reuse or disposal. Independently tested and certified to meet CE and ANSI standards for safety and compatibility worldwide. Erases the highest-coercivity magnetic media made, including perpendicular and longitudinal laptop, desktop, and network drives up to 1.25 in. high and 5,000 Oe, as well as 3,000 high-coercivity tape media—without adapters. The 45-second erasure cycle and continuous-duty rating, with no cooling required, allow you to quickly and permanently erase magnetic media containing the most sensitive top-secret data. Uniformly distributed 20,000-gauss power magnetically erases a wide selection of high-coercivity hard drives and tapes, ensuring top-secret classified data can never be recovered. Magnetic erasure also means there’s no software to buy, update, or upgrade. And the TS-1 technology used to erase magnetic hard drives and tape media will never become obsolete due to software or driver modifications. The TS-1 is the ultimate solution for permanent erasure. 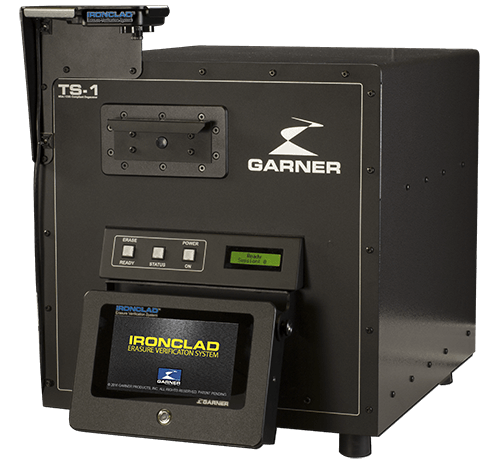 The TS-1 uses our proven solid-state technology to generate a high-powered erasure field that’s far superior to the fields produced by the read/write heads in hard drives and tape drives. The 20,000-gauss field uniformly delivers erasing power to every area of the media in a way that software-based wiping can’t begin to match. Unlike overwriting that requires a physical connection to the hard drive, such as a cable, the TS-1 erases data on working and nonworking hard drives. Degaussing technology also makes the TS-1 software independent, so that you can completely and permanently erase any magnetic hard drive or tape, regardless of the operating system or interface. To be added to the NSA/CSS Evaluated Products List (EPL), degaussers are laboratory tested to ensure complete erasure to the level required for U.S. government classified top-secret data. The TS-1 is independently tested and certified to meet CE and ANSI standards for safety and compatibility worldwide. The TS-1 meets NSA and NATO top-secret data requirements. As data technology evolves, data destruction technology must too. The PD-5 with optional SSD-1 meets the challenge by delivering high-speed, high-powered destruction across the spectrum of today’s commonly used data-storage media. The PD-5 operates as a standalone unit or as part of a complete degauss-and-destroy system, when paired with our NSA/CSS EPL-listed TS-1 degausser, feature-filled HD-3WXL degausser or budget-friendly HD-2.